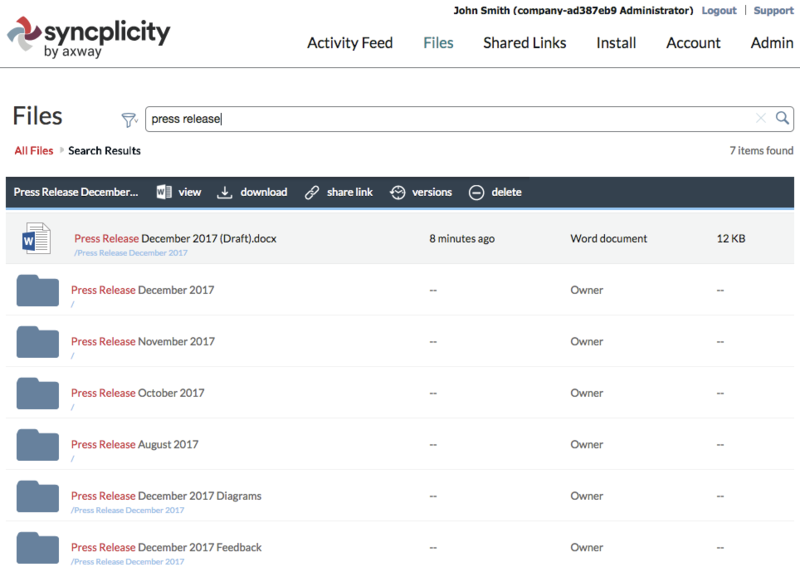 From My Syncplicity, click on Files at the top navigation menu to access your folders. Locate the Search text box at the top right of the page. If you do not see the Search text box on files page the search feature may be disabled for your account. 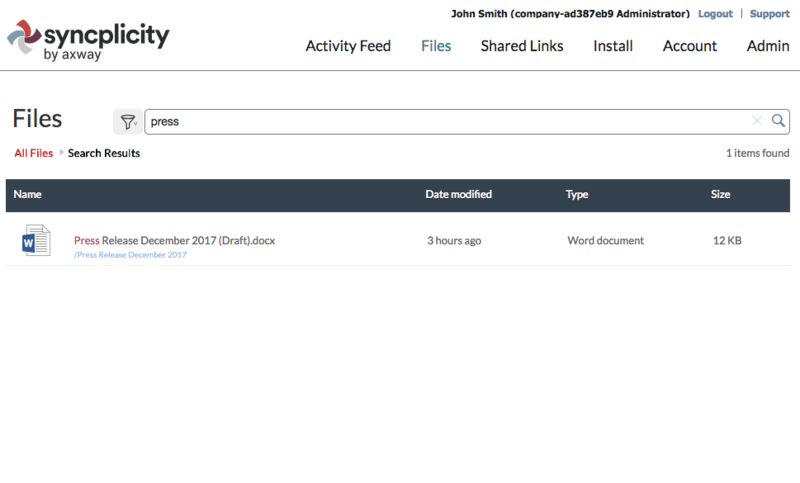 Contact Syncplicity support with feature activation request. Being typing your search query. The latest search queries are displayed in search suggestions box. Click one of the suggestions from the box or continue typing your query. Select the enter key to perform search whenever search query looks complete. Use the arrow keys to choose one of the suggestions and hit enter key to get search results. Perform the same actions on the selected file or folder that you do when you navigate to the parent folder of it; use the action menu to view the actions that are available for the file or folder. Each search result allows you to quickly navigate to its parent folder by clicking on the link under the file or folder name. Click on top-level folders to navigate to the top folder list. 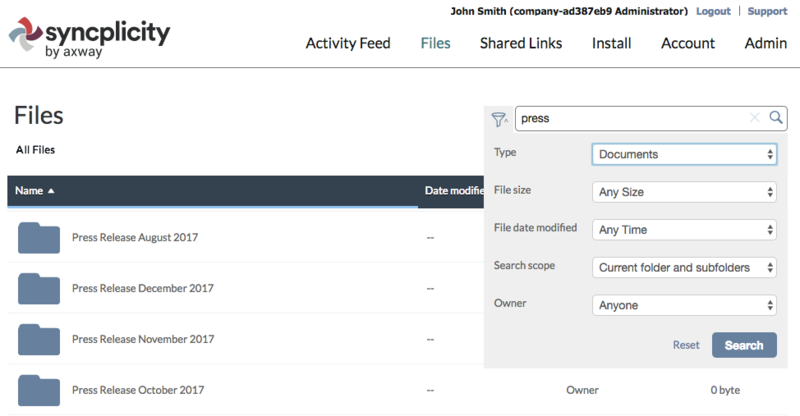 The search scope is contextual; if you start a search from a top-level folder list screen, the search is global and is performed across all available folders and files. If you navigate to the particular folder first, and perform the search there, the search scope is limited to the folder, all subfolders, and all files located in them. You can refine your search query with advanced search options. For example, use the Advanced Search feature to find a document (not a folder) with a specific size that was modified by you with a name that contains "press". To bookmark the search, save the URL. Make sure you bookmark the search request and not the results. To reset the advanced search options back to the default values, click the Reset link located on the left side of the Search button at the bottom of the Advanced Search screen. To close the advanced search options without resetting them, click the filter icon again or select the Esc key. Search queries are not case sensitive. You can use a few characters from the beginning of the word that you are searching for in the file or folder name or in the file content. 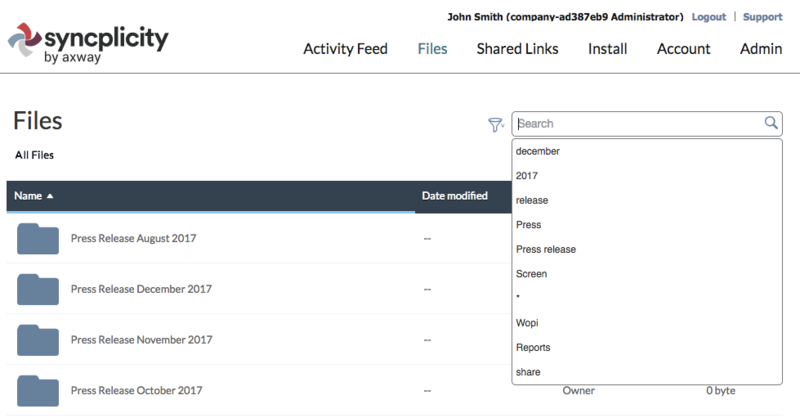 For example, searching for "feed" will return the folder "Press Release December 2017 Feedback". In cases where file and folder names contain words separated by special characters, for example, press_release, you can perform a search on part of the word, such as "release", and the search result will return the folder "press_release" and the file "PressRelease.pdf". If you know the exact search phrase that you are looking for, use double quotes to filter out other results. To quickly select the Search box use the forward slash "/" or "f" key. To quickly open the advanced search panel use the "Ctrl+Shift+/" or "Ctrl+Shift+f" shortcuts. To select the next search option, use the "Tab" key and "Space" key to expand a specific option or perform the search when the focus is on the Search button. To quickly navigate between different search queries and results that you performed sequentially, use your browser's Back and Forward buttons (and keyboard shortcuts). To find all files with a particular extension, use the wildcard symbol asterisk "*". For instance, if you want to find all documents with the "docx" extension, you can use "*.docx" query. In all other cases, wildcard symbols ("*", "? ", "%") will be omitted. If a file or folder name contains wildcard character and you want to use it in the search query, use double quotes. The Search feature is available for US region business users upon request. 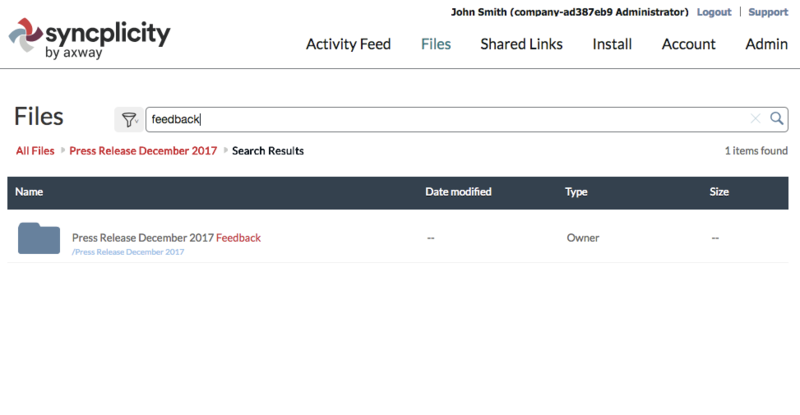 Contact Syncplicity Support (support@syncplicity.com) to activate the search feature for your account. File content search is available only for Syncplicity Cloud Storage US On-premise StorageVaults. Syncplicity Cloud Storage EU currently supports only file and folder name search.